My sister-in-law, Jaclynn, recently whipped together this healthy blueberry muffin recipe aka blueberry lentil muffin recipe. She loves experimenting in the kitchen and decided to try and integrate lentils in a muffin recipe. Shhh... don't tell the kids. When she told me she made the muffins with pureed lentils I was skeptical, but WOW... these muffins are healthy AND delicious. Jaclynn was kind enough to let me share her recipe here. Enjoy serving these healthy dessert treats at your tea parties, luncheons, and slumber party breakfasts! Puree strained lentils with the apple juice. Add maple syrup, vanilla, and oil. Add eggs and stir till smooth – no need to use electric mixer. Add as many blueberries as you like (I used 1 cup of fresh blueberries). Pour batter into a lined muffin pan, or small cake pan. Bake at 375 for 30 min or until muffins spring back when lightly touched in the middle. 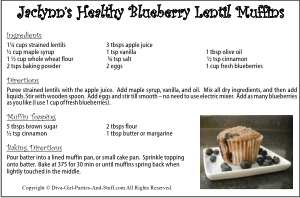 Want a Printable Blueberry Muffin Recipe Card? 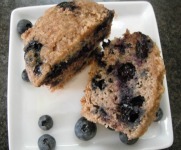 Simply fill in the form below and you'll have immediate access to these healthy blueberry muffin recipe cards. 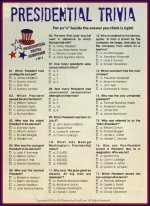 Print one for yourself and share one with a friend. for a Christmas tea party this year.